McLean, Va., November 30, 2017—Corcentric, a provider of cloud-based financial process automation solutions, awarded student teams in the University of Maryland’s Honors College Entrepreneurship and Innovation Program (EIP) a share of nearly $2,000 in prize money at the first Corcentric Case Competition. Students were challenged to develop a new product or service idea and marketing strategy to monetize Corcentric’s data. 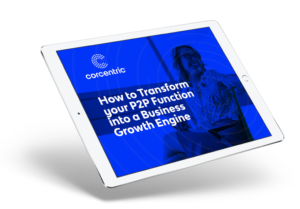 Their tasks began with a thorough company review and an analysis of Corcentric’s customers and competitive landscape, along with the risks and mitigation strategies for offering a new product. Teams then offered a definition for a new product, along with a potential marketing strategy. They had to verify their findings through at least one prospect. “The Corcentric Case Competition gave our students the opportunity to apply their entrepreneurial thinking to a real-world challenge,” said EIP Director Jay Smith. “This experience, coupled with the fact that they presented their ideas to the company in-person and received feedback in real time, was invaluable. In addition to the in-person case kickoff and presentation events with the company, the UMD student teams held two interim teleconferences with Corcentric to answer questions and help move their concepts forward. Students presented their solutions to a panel of judges, who evaluated each team’s findings based upon their coherence, comprehensiveness, concision, professionalism, and how convincing each case was. The winning team, led by sophomores Rohan Dixit (Computer Science), Matt Fan (Mechanical Engineering), Chris Wolfe Mechanical Engineering) and Chayce Wong (Business), received $1,000 for PROCOR, a proposed intelligent procurement system that would utilize Corcentric’s historical procurement data to reduce inefficiencies between buyers and sellers and minimize cost and lead times. The second-place team, comprised of sophomores Abdul Ali (Finance), Ankit Sheth (Finance), Nathan Wagener (Mechanical Engineering) and Fiona Whitefield (Public Health Science), won $500 for Blockchain, a proposed system for treating transactions as blocks, which can be broadcast to every party in a given network, each of which offers validation. The blocks can then be chained to create a transparent record of transactions. Taking third place was team Cordata, with sophomore Richard Kong (Computer Engineering), and freshmen Michelle Hu (Finance) and Simin Li (Engineering) receiving $250 for their transaction analysis idea. Fourth-place team Startup Centric, comprised of freshmen Neil Duggal (Business), Ryan Pindale (Physics), Alex Leipold (Business) and Matt Frohman (Computer Engineering), won $200 for their proposed system of Corcentric support for startups. “It was an amazing opportunity to work on Corcentric’s products and learn more about the many impacts of big data now and in our future,” said EIP student Simin Li. Judges of the competition included: Corcentric Chief Operating Officer Matt Clark, also a 2001 University of Maryland alumnus; Sudarshan Ranganath, Vice President of Product Management for Corcentric; LeRoy Pingho, Chair and CEO of Overture Technologies; and Victoria Zhao, Venture Analyst for Mtech Ventures and a May 2017 EIP alumna. Corcentric has supported EIP with $25,000 for this academic year. The company was also a Gold Level Sponsor of the EIP Terp Tank competition last spring, through $5,000 in support.